Starting nursery has been a massive period of adjustment for our whole family. Firstly, there’s the emotional side – Lu took a little time to settle and come round to the idea of even being left. Thankfully the goodbyes are much easier now and I know in time she’ll get the hang of all those wonderful sharing and teamwork skills that nursery gives her the opportunity to develop. It’s been an emotional time for Matt and I too, we still can hardly believe se’s big enough to go off and do her own thing even for a short time. Now that I’ve had a month or so to get used to the idea I’m loving the extra bit of freedom to get on with things in the morning and more time for fun in the afternoons. One aspect that we’re still getting to grips with is the busy mornings – I know this is something parents struggle with everywhere! It’s no mean feat getting everyone happily out the door, fed and in clean clothes. Luisa has it easy, with a nursery uniform but I’ve been struggling a little with my own wardrobe. Not having masses of time to get ready has led to some… interesting outfits for me! Last week I had to resort to a galactic cat jumper usually reserved for sofa days. Not a good look on the school run… If only mums had a uniform too! 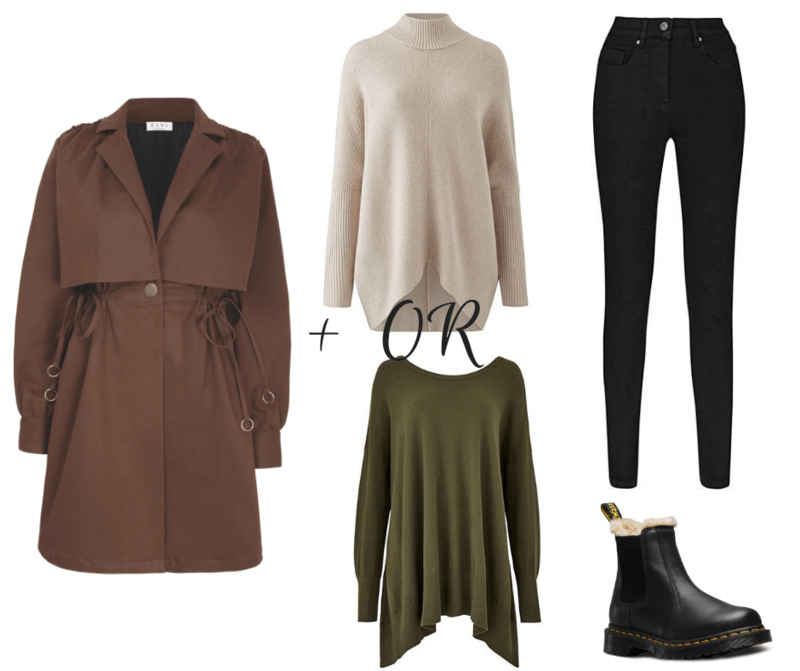 Welcome to my virtual shopping spree – this is my ideal ‘Mum uniform’ for cold weather. I do own a couple of these already and will hopefully be picking up a few more soon, i’ve linked to items where possible – in case you want a closer look. This trench was kindly sent to me by Elvi – it’s gorgeous, really well cut and a bang on trend colour. I love it! So far I’ve been wearing it with skinny black jeans (Lucy from Fashion World are my favourites) and a thin knit jumper or a rust blouse. I have these Leonore Dr Martens chelsea boots that Matt bought me for Christmas last year, they’re a life saver on cold mornings especially! You can’t go wrong with a cosy parka, I haven’t got a ‘proper’ coat like this at the moment, I’m still dithering but i’ll have to make my mind up soon as it’s getting cold fast. I think this pink jumper looks so comfy and easy to wear, pull it on with jeans and you’re out the door in no time. Zara are selling lots of similar styles at the moment too. The leopard print jumper is from Primark and is super duper cosy. Firmly on my Christmas list is a cord sherpa from Levis, they’re just so classic, Matt has one and absolutely loves it. 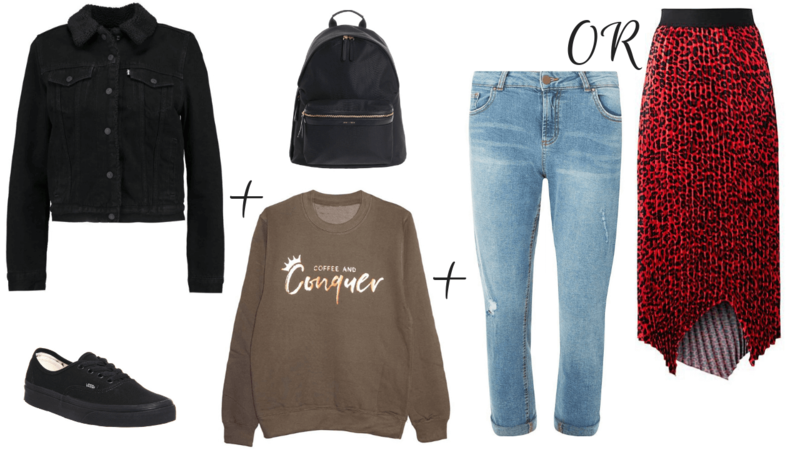 I’d wear mine with my favourite slogan sweatshirt from Ada and Alfred and either boyfriend jeans or a swishy skirt. This red leopard print one reminds me a lot of *that* Marks and Spencer skirt everyone has on Instagram. I love this, I never know what to wear for the school run, I always look a mess not the stylish mum I want to portray haha.